November 08 - An odd month because much of the time we were either working very hard or our minds were on our impending holiday to Kenya. 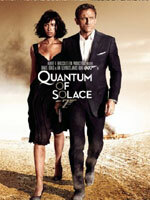 We did manage to get to the cinema to see Quantum of Solace. The film was so popular that one evening we were ready to go when we discovered the showing we wanted was effectively sold out so we went for a meal instead. The film was just as we expected - loads of action and less story than most of the previous Bond movies so you can just imagine it virtually had no story at all. One critic said they enjoyed the film immensely at the time but when asked what it was all about they realised they didn't have a clue - that sums it up. As one critic summarised: "Mystifying title, accident-prone production, awkward end-product... This is 007 in mid-story crisis; a festival of blaring action set-pieces propping up a scrappy script and undercooked characters. From blond Bond to bland Bond". 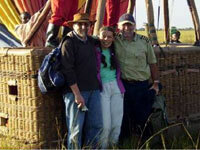 The day arrived when we were to get the overnight flight from Heathrow to Nairobi. Unusually the journey to the airport, always stressful, was uneventful and apart from a hiccup with security because we had anti bug stuff that was in a 150ml bottle but we were only allowed 100ml in a single bottle. The joke was that we went away, bought two unlabelled 100ml clear bottles, decanted the bug stuff into them and then went through security without a problem. In terms of risk which was greater, one 150ml bottle that said Jungle Formula Insect Repellent or 2 unlabelled bottles that could have contained anything? After an uneventful but uncomfortable flight we landed in Nairobi 30 minutes early which was then lost by waiting an hour to get through immigration. It seems the Kenyans learned everything the British know about bureaucracy and then slowed it right down. And of course we wish all of our friends and family a very Merry Christmas and a Happy New Year.